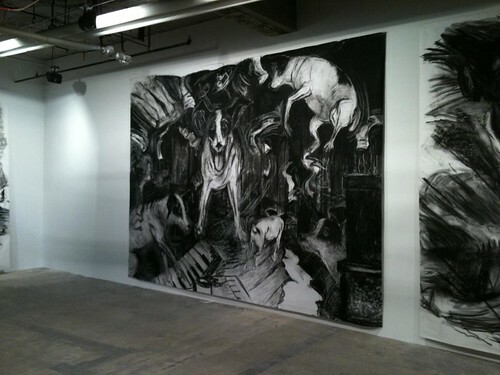 Laurie Anderson imagined her terrier’s adventures in the Tibetan Buddhist afterworld and committed them to paper in “Lolabelle in the Bardo,” a series of enormous drawings showing at the Vito Schnabel Gallery in SoHo through Saturday. Earlier in the year, Anderson talked with Amanda Stern for The Believer about the very specific kind of grief she felt when the dog, her constant physical companion, died. She was my best friend. When you’re very physically attached to something — not so much mentally, but physically, something that is always at your knee, you know — it’s very different when they evaporate. So in The Tibetan Book of the Dead, for forty-nine days you’re in the Bardo, and it describes in a really fascinating way how you lose your senses and how your mind dissolves as you prepare for another cycle. At the end of that forty-nine-day period, you are born in another form, and, in my dog’s case, what was at the end of that forty-ninth day was my birthday. I’m kind of a believer in magic numbers, in a way. So I wanted to study that particular Bardo, and then I found that that’s only one of the many Bardos. The other Bardo that is happening is the Bardo that we’re in right now — in which we both believe we’re having a conversation in a studio by the river when, in fact, we’re not. Max took this photo at the gallery yesterday.